When was the last time you were invited to a pig roast? Seriously, when? Maybe you've been to Hawaii for a luau and had roast pork, tasty drinks and live music. Well, we aren't quite Hawaii, but we can still eat, drink, and dance to celebrate the season. We want to make unique memories with you! Do something different and join us at the inaugural NightHawk Tuscan Pig Roast on Saturday, November 11th from 12-6 pm. It takes a lot of work to build a giant roasting pit. Chef Josh and Don put blocks into place for the big event. Think of the experience-- Chef Josh slowly roasts two of his pasture-raised whole pigs on an open fire of crackling hardwoods, apricot wood, and Chambourcin grapevines. 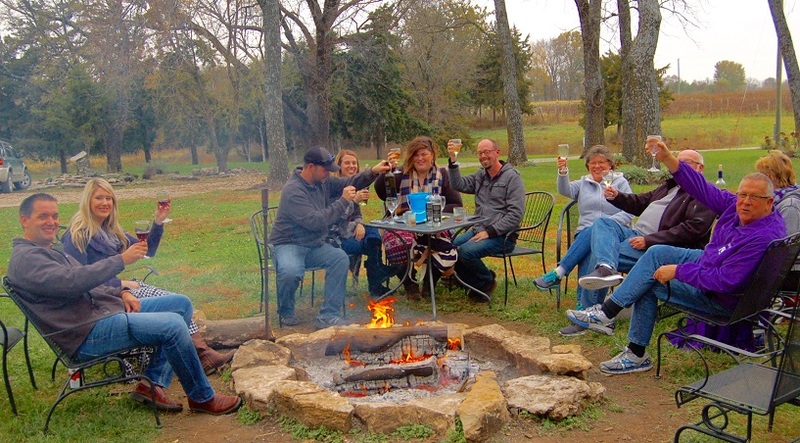 The woodsmoke is in the air and you're drinking wine with friends. This gourmet meal ($25) also includes side dishes; a portion of savory fire-roasted whole pumpkin, wild rice goat cheese and herbs, a tasty side salad, and the best Black Forest brownie you've ever had. Wine is sold separately and we recommend our autumn favorite Baco Noir dry red, Firefly, or Osage white to perfectly complement this very special meal. We'll feature live music by No Fly Zone to keep the good vibes and the good times flowing. If you’re worried about chilly air, please don’t let that stop you. We will have our fire pit ablaze and an indoor fireplace with space for 30 to cozy up to. Bring a blanket -- we're all friends here! Weather happens but the good times must go on! We're excited to offer you a chance to come out to the country for a day of amazing memories. Reservations aren't specifically required, but please reserve your spot just to make sure we know you're coming. Be a part of the first NightHawk event of its kind! Spread the word to your friends and family—let them know there’s something special to do on November 11th. The best part about NightHawk is meeting great people... we hope to see all of you here (even if it's not Hawaii).